Sometimes any developer has his moments when a feeling of frustration becomes overwhelming. This just happened to me when trying to create with Eclipse a new project from GitHub and using EGit plugin for synchronization with remote repository. Select "File -> Import" menu and from there go inside the tree structure to "Git -> Projects from Git"
I found that other people where successful by using http protocol instead of https. 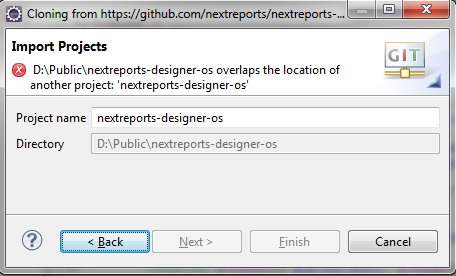 So, using a url like http://github.com/nextreports/nextreports-engine.git showed me the master branch. Hurray, I said! This told me that I could synchronize only with my local repository, but not with the remote git repository because fetch failed. Why? It didn't say. I felt so frustrated after looking around for hours. Because I really needed to do some work and not just configurations, I gave up and I started to use git commands from command prompt to pull and push my work. When I had time to investigate further, I started to look again because frustration grew bigger. Project had an Ivy dependency management and Ivy Resolving or Refreshing where not working from Eclipse, letting me no choice just to use ant commands from command prompt. Eclipse started to look just as a simple editor ... Everything I needed to do requested using command prompt commands. 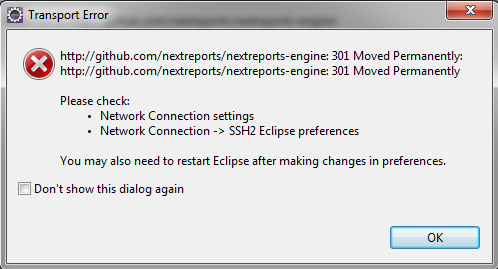 And as a bonus, sometimes a plugin from eclipse could not be installed on my computer. This forced me to add the proxy settings directly to eclipse.ini file (-Dhttp.proxyPort=... -Dhttp.proxyHost=...) I realized that those plugins with https inside their URI were the culprit. 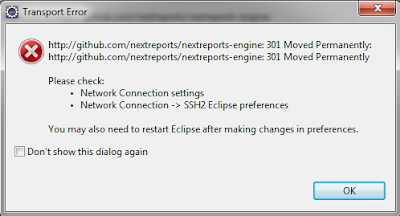 So, just a proxy setting caused so much trouble in so many places inside Eclipse. Sometimes, solving a problem can take just a second, but only after hours or days of frustration.